The cube is the most basic shape. You will need to be able to draw it from any angle. Drawing the cube and similar objects (such as books, boxes etc.) is the simplest way of understanding the notion of perspective. The cube below is drawn in a 2-point perspective. Practice sketching cubes and similar objects from different angles. Review the previous lesson about perspective. The materials used in the video are: printer paper, soft charcoal pencil and an eraser. If you decide to use the charcoal pencil get a soft one, and also get a special eraser for charcoal. We recommend that in the beginning you use a simple graphite pencil. The softness (how easily the pencil leaves a mark on the paper) is indicated with a letter on the side of the pencil. We recommend you to use B, 2B and 3B pencils. We don't recommend buying expensive drawing pads, or spending a lot of money on special paper in the beginning of the learning phase. When you feel more confident with the pencil, using a more advanced paper will be justified. 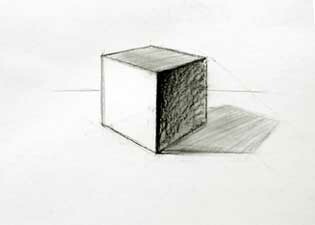 If you are new to drawing, start from simple objects such as the cube, the ball and the cylinder, which are the building blocks of the more complex shapes. Drawing the cube helps to understand the notion of linear perspective (see previous lesson). The cube sketch from the video. In this case the cube is drawn using two point perspective. You can check this by continuing the vertical lines on the edges of the cube. You will notice that the lines are parallel to each other, while the horizontal lines intersect at the horizon. Compare this to the drawing below. Two point perspective is the most commonly used perspective by artists. 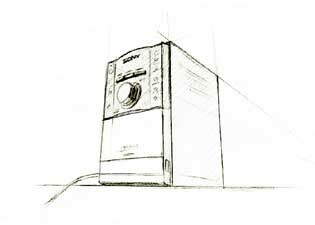 A sketch of a rectangular object drawn using three point perspective. This time the object is drawn from a very close distance. Check that the vertical lines are not parallel to each other.